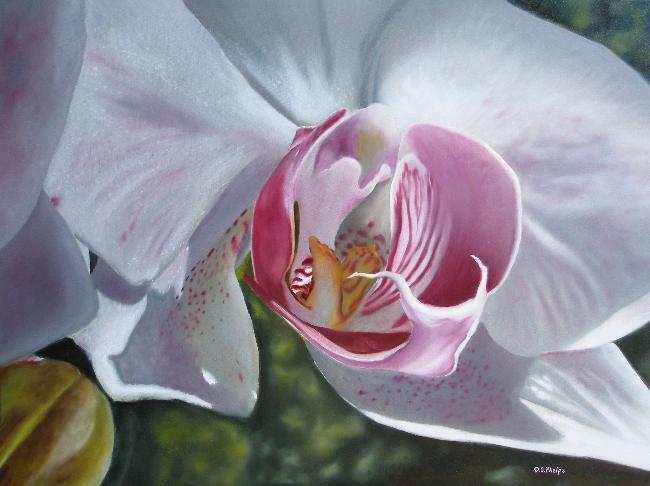 Phalaenopsis orchid or Moth orchid painting,and it's story. 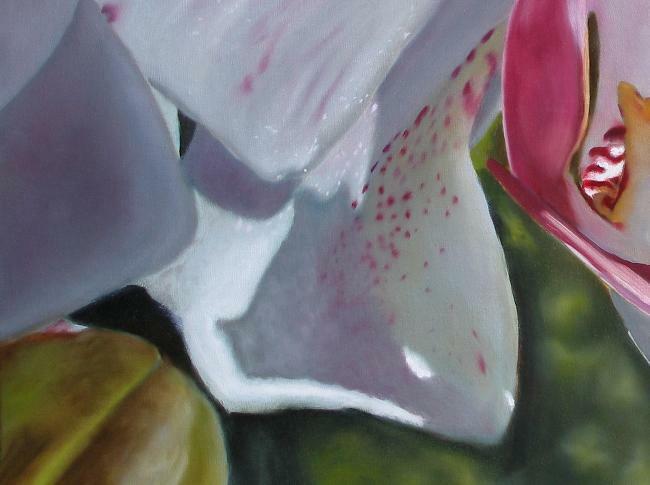 Key West Orchid, a Phalaenopsis orchid painting. And why am I having to look up to see it? This Phalaenopsis orchid was one of many found on a recent trip to Key West. Have you ever seen an orchid in its natural habitat? I was trying to figure out what is on an orchid that makes it shimmer, like glitter, in the daylight. I had never seen this before in orchids in my house. It was like tiny particles on the pedals that captured the sunlight. I've tried to depict it here. This is an unusual perspective...the natural perspective if you will. Most of us see these only as cultivars wired up to small stakes in an upright position instead of their normal profile...nicely! This is the view from below looking up into the trees where these happy guys live! Go Ahead! Click on a thumbnail to get the full view up close! 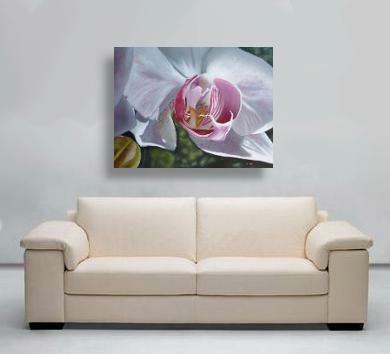 The moth orchid is a long-lasting and particularly elegant type of flower. 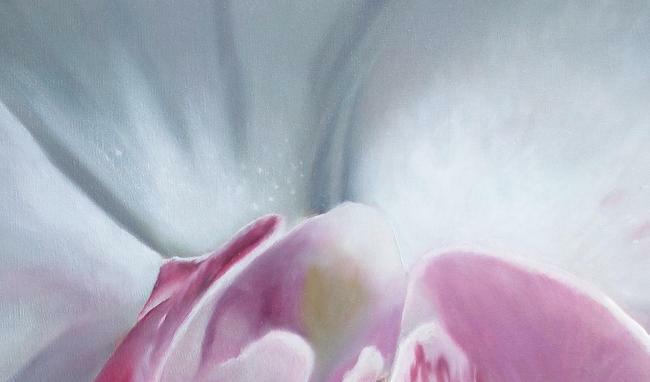 Their graceful appearance draws immediate attention, and their reputation as an exotic and unusual flower evokes a sense of refinement and innocence. With 25,000 different types existing naturally and more being discovered each year, orchids are one of the largest flowering plant families (could there be more than the rose?). Although they are commonly thought of as tropical flowers, Phalaenopsis orchids grow naturally in almost all climates. 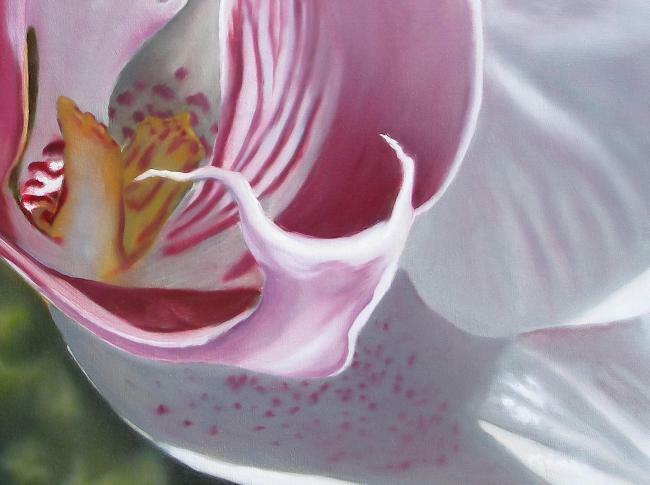 Despite their versatility, there is something distinctly exotic about the moth orchid. They are simply exquisitely beautiful to the everyday flower lover. When giving the orchid, it can impart a wide variety of messages, but historically the meaning of orchids is to have wealth, love, and beauty. To the ancient Greeks, orchids suggested virility, and after the rise in popularity of orchid collections in Victorian England, the meaning of orchids moved towards being symbolic of luxury. Orchids have also been believed to carry various healing and protective properties, allowing them to ward off disease. The Aztecs were said to drink a mixture of the vanilla orchid and chocolate to give them power and strength, and the Chinese believe orchids can help cure lung illnesses and coughs. Today, the meaning of the Phalaenopsis orchid is generally regarded as symbolic of rare and delicate beauty. Orchids are a very popular houseplant. Their charm and mystique delight those who receive them, for few other flowers have the ability to impress their recipient in the same way that the orchid can. Among the many different types of flowers available, the orchid holds a special place as one of the most alluring and captivating, making them a special choice for the treasured people in your life. Are you interested in how this was created? 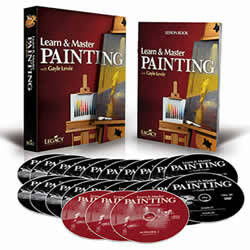 Click here to understand more about my process and guarantee when buying online. Would you like to take it home! Sorry, this painting has sold, but click here to whats new. Size: 30" X 40" oils on linen. 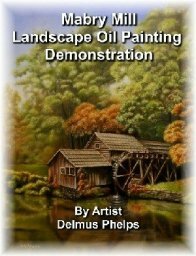 An original, one-of-a-kind by hand created oil painting. Click here to head back to top of our Phalaenopsis Orchid page.